There is a lot of value information to build your business and refresh yourself on OSHA requirements. Course was easy to follow, easy to take. Provides adequate knowledge and questions for study. Thanks a million! Found the course to be very informative. The knowledge in this course is very useful ! Course was well put togther. The use of videos provided a nice break from constant reading. I would take more courses from this. Definitely a recommended course for continued education! Good information providing practical applications to my business. Very informative and educational there is information that every construction worker should know. Best Continuing education course yet. I'll be using this one again next time I renew. 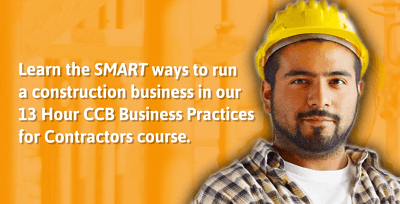 Comprehensive, well produced and covers subjects that contractors can actually use. It was a good course because it had information that can be beneficial for the company for future purposes. Its good training but its too broken up into sections. The Marketing and Sales section was particularly helpful. The rest of the course was concise and not excessive or redundant. Sales and Marketing series was stellar! I like the fact that I can go at my own pace. Like the slide structure and the content very specific and to the point. Well done. easy to use. saves where you leave off. makes continuing education much easier. An option to have it read out loud would be awesome. This was a good course. Easy to use and good information. Awesome courses that are informative and to the point. I would highly recommend to a former contractor! it's a great course, a lot of informations. The most thorough and informational continuing ed course I have taken. Easy to navigate. Like that you read instead of just video's. Definitely recommend it for anyone who is busy yet need to get their CE done. You get it done on your own time! Simple, to the point, and doesn’t waste time for those who have a busy schedule. Easy to navigate and the self-paced feature is nice. Study in your free time. Great information and well delivered to read. It was good for what I needed. Great coarse. Easy to follow. ***** GREAT LINEOUT ANDEASY TO WORK WITH . Loved the course . We'll put together. Great refresher. It was easy to navigate, and had lots of information. Always enjoy learning from your courses! The videos broke things up and were helpful. It was a very informational training and course. It is a good course, a lot of informations that not found in the book. The course is nicely laid out, and informative! Very informative, a lot of reading but information was useful. IT WOULD BE HELPFUL TO HAVE A AUDIO OPTION FOR THE SLIDES, OR A PRINTABLE VERSION AS LOOKING AT A COMPUTER SCREEN FOR SO MANY HOURS IS STRAINING ON THE EYES. This course was very easy to understand and follow. I highly recommend it. Very nice, very informative. But would like more demonstrations or drawings of the things i learned so that i could visually memorize it. Overall the course was great! Program is easy to use and study material current. Lots of good info. I picked this one because I used this same one to complete CCB licensing to get my original license. I like course I chose! The materials are clear and vital! Suggestion: it would be perfect to see also pictures how it should be instead for "FOCUS FOUR" course so we could view it visually and memorize right safety practices to comply with OSHA rules... Thank you! Very Thorough and informative as well as effectively simple to maneuver and user-friendly. All Topics very relevant and up to date. Quality product, I would not use any other program. It was informative and answered questions I didn’t know I had. Recommended to another. I really enjoyed this course. It was easy to navigate and clear communication. Convenient on-line course. Great, informative material. I thought your coarse was informative. It allowed me to go about it at my own pace . the coarse wasn't to redundant. I would use your school again. very good course covered the subjects well. I actually took notes to refer back to, great stuff! It was very helpful for me and I learned a lot. Courses were brief to the point. It was good, straight forward and easy to navigate. I give the class a 5 because it was short and easy to comprehend. one thing I do wish it had move of is a few more videos. My friend told me other courses do not require test. I like it to test my understanding. Some of it seemed long. I really like this course. I learned a lot from it. Recommended it. Very informational and easy to use on phone. It was easy to access course and user friendly. So much text. Some of our eyes just cross when looking at that much text. Great course! Cool that you are in Gold Hill! Thank you. The project management course was very informative and I will have to review of all that information. Everything else was very adequate. good class for refresher or just getting knowledge. wished there was more videos or option to have it read to you. The section on management practices tended to get a little academic. Some of the course got really lengthy, shortening the reading material to more key points would be helpful. Leave the bubbles with the faulty construction practices on the last section up. Don't have them blink on and off. It was frustrating trying the speed read and wait until the bubble popped up again. The OSHA section was very detailed. The Sales section was excellent. The Marketing section was mostly designed for product sales and was social media heavy and therefore a stretch to apply it to Residential Construction. The Project Management section seemed like it was designed by a grad student who had never stepped on a jobsite. It was like it was lifted from a textbook and more in line with widget manufacturer requirements than construction. There are course that read each slide out loud so you can listen instead of read. Long and boring but certainly quicker than it could have been. The combination of video and reading was good. Having just 1 question per section was good. Some interesting and helpful info. More interesting than some courses. more videos would be helpful. Although informative I find that a very large amount of this has nothing to do with my buisness as a chimney sweep. Also I would find it much easier to take in and understand if it were in video form. Thanks for asking. I would like to have the option to have it read to me even if it is only the audio. not sure why im being taught how to market and advertise.... thanks but no thanks.